The Toyota RZ engine family is a straight-4 piston engine series built in Japan. The RZ series uses a cast-iron engine block and aluminum SOHC or DOHC cylinder heads. It has electronic fuel injection (EFI), 2 or 4 valves per cylinder and features forged steel connecting rods. The 1RZ is a 2.0 L (1,998 cc) version built from 1989. Bore and stroke is 86 mm × 86 mm (3.39 in × 3.39 in). The 1RZ-E is the fuel-injected version of the 1RZ. With a compression ratio of 9.0:1, output is 101–108 hp (75–81 kW; 102–109 PS) at 5,400 rpm with 118–123 lb⋅ft (160–167 N⋅m) of torque at 2,800 rpm. With redline at 5,500 rpm. The 2RZ is a 2.4 L (2,438 cc) version. Bore and stroke is 95 mm × 86 mm (3.74 in × 3.39 in); a variety of combination of heads and fuel delivery systems were available. This is an SOHC engine with two valves per cylinder. Valve adjustment is by shim over bucket. Output is 120 PS (88 kW; 118 hp) at 5,200 rpm. Originally manufactured with a carburetor induction system, it was later upgraded to Electronic Fuel Injection, with the -E suffix added to the engine designation. Toyota specified unleaded fuel with a rating of at least 91 RON in Australia. The 2RZ-FE, and 4RB1 or 4RB2 in China, is a 2.4 L (2,438 cc) version. Bore and stroke is 95 mm × 86 mm (3.74 in × 3.39 in). Compression ratio is 9.5:1. Output is 142 hp (106 kW; 144 PS) at 5000 rpm with 160 lb⋅ft (217 N⋅m) of torque at 4000 rpm. This engine does not feature balance shafts. It has four valves per cylinder and DOHC. Valve adjustment is by shim over bucket. The 2RZ-FE is an interference engine. The 3RZ-FE is a 2.7 L (2,693 cc) version. Bore and stroke is 95 mm × 95 mm (3.74 in × 3.74 in). Compression ratio is 9.5:1. Output is 150 hp (112 kW; 152 PS) at 4800 rpm with 177 lb⋅ft (240 N⋅m) of torque at 4000 rpm. This engine features twin, chain-driven balance shafts. It has four valves per cylinder and DOHC. Valve adjustment is by shim over bucket. The 3RZ-FE is an interference engine. 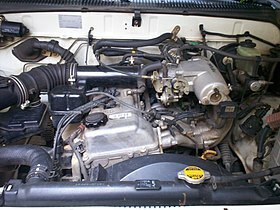 Wikimedia Commons has media related to Toyota RZ engines. This page was last edited on 6 April 2019, at 11:03 (UTC).